An early winner for ZTE that has sunk to less impressive depths given how long it's taken to release. ZTE has big ambitions to join the likes of HTC and Samsung at the top of the Android pile, and the ZTE Grand X is the company's biggest statement of intent yet. With stock Android 4.0 Ice Cream Sandwich and a dual-core Tegra 2 processor, the Grand X sets out to give you a lot of bangs for not a lot of bucks. If the ZTE Grand X heralds anything, though, it's the emergence of a new Android middle-class. We can say that because, while the handset performs admirably, it's clearly not in the same league as the Samsung Galaxy S3 or the HTC One X. That's apparent from the first time you hold the Grand X in your hand. The words solid and functional come to mind, but definitely not premium or even attractive. It's a well-built, chunky phone in a way that reminds us of a previous-generation HTC handset like the Incredible S - but without that device's classy unibody design. Indeed, because of its smaller dimensions and thicker 9.9mm chassis the ZTE Grand X actually feels heavier than the likes of the massive HTC One X, even though at 110g it's lighter by 20 grams. The Grand X is an all-plastic affair with a decidedly traditional design. The battery cover is made from matte plastic with a heavily textured feel - rather like the Samsung Galaxy S2's. It peels off at the lower-left corner via a handily-placed ingress, offering up just enough resistance without making access to the battery too awkward. This is also the way in which you access the Grand X's microSD slot, which sits above the battery and to the right of the regular SIM slot. The fact that you can access this memory expansion slot without removing the battery isn't just a matter of convenience - the Grand X lets you hot swap microSD memory. That means you can remove and replace memory without turning the handset off, much like you would on a computer. It's a good job too, as left to its own devices the ZTE Grand X's 4GB of internal storage will soon fill up once you start taking pictures, installing apps and putting your music onto it. It's a shame there isn't an external port for this purpose, as with the Samsung Galaxy Ace 2, but at least this way there are no untidy flaps. While it's together the Grand X feels secure, with an acceptable level of flex and minimal creaking. Overall, despite picking up a number of design cues from Samsung (head-on it almost looks like a Nexus device) and HTC (see above), we wouldn't call the Grand X a looker. But then, the key selling point of the ZTE Grand X is its near-top-end performance at a sub-£200 price. Something had to give, and that something appears to be in the design department. Boot the Grand X up and you'll see the first of its upper-mid-level components in action - a 4.3-inch qHD LCD display. It was only around a year ago that this kind of screen was considered to be top-of-the-range in handsets such as the HTC Sensation, so it's good to see something similar in such an affordable phone. 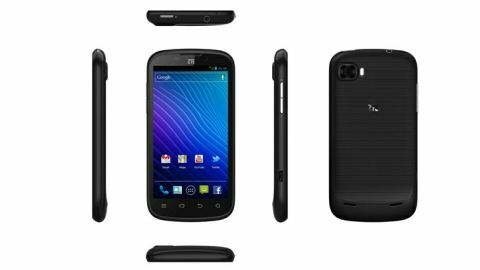 Of course, the Samsung Galaxy Nexus has since moved the Android display game on to the tune of 4.7-inches and 720p, but that's evidently not the fight the Grand X is looking to pick. We have to say that the display lacks something alongside the same-sized Samsung Galaxy S2, even though at 960 x 540 pixels it's a fair bit sharper. That's mainly down to a relative lack of brightness and vibrancy even at the top setting - there's a slightly washed-out feel evident in pictures and videos that had us hankering for the AMOLED alternative. The screen's responsiveness also isn't quite up to scratch, with the odd command requiring a second or even third firm stab of the screen to initiate. Underneath this 4.3-inch screen you'll find a row of four capacitive buttons for menu, home, back and search. It's arguable that the search button isn't strictly necessary, but we'll come to that in the Interface section. Along the left-hand side of the Grand X you'll find the volume buttons, which fall nicely to finger or thumb, depending on which hand you hold the phone in. Further down this left-hand edge you'll find the standard microUSB slot for charging and computer hook-up purposes. The 3.5mm headphone jack and power button are exactly where you'd expect them to be - on the top-left and top-right edge of the Grand X respectively. While some bigger devices, such as the Samsung Galaxy Nexus, have wisely moved the power switch to the right hand edge to avoid over-stretching your forefinger, the smaller ZTE Grand X remains small enough that the top is still the optimum position. For all these cosmetic concerns, one of the big things that makes the ZTE Grand X more desirable lies hidden from view. Lying at the handset's core is a 1GHz Nvidia Tegra 2 processor. What sets this apart from the vast majority of mid-range Android handset processors is the fact that it's dual-core. Not only does the current Android OS take advantage of dual-core architecture to boost intensive tasks like HD video and web browsing, but app and game developers are also making use of it too. As with the ZTE Grand X's display, this is a component that could be associated with high-end Android devices just last year, so its presence in a £189 handset is highly impressive - even if it's no longer cutting edge. 'No longer cutting edge' is the most that could be said for the ZTE Grand X's camera. At 5-megapixels, and with video recording set to an inexplicably low 720p, this particular component falls some way short of last year's top-end devices. Along with the overall design, this is the single biggest indicator that we're dealing with a device that's been compromised to reach a price point. One final, slightly troubling point to make about the ZTE Grand X in general use is that we had the device crash on us on three separate occasions over the week we had it. On each occasion it happened while the phone was asleep, and we could neither wake it nor restart it without removing and replacing the battery. Of course, Android isn't known as the most stable of mobile operating systems, but stock Android 4.0 has seen a big improvement on other devices. It's something to bear in mind when considering a purchase.